There are plenty of obscure cars, but few can match the Goggomobile Dart for sheer improbability. The original Goggomobil was a post war German microcar with a 2 cycle 250cc 15hp motor. So what about the Dart? Well, believe it or not the Dart originated in Australia,by way of Dingolfing Germany. At the time, Australia had prohibitively high import taxes imposed on foreign cars. Bill Buckle of Sydney discovered that he could circumvent the tariffs by importing the chassis and mating the chassis to an Australian made body. Apparently Goggomobil maker Hans Glas was the only manufacturer which would go along with this scheme, and Buckle Motors became the sole purveyor of fiberglass bodied Goggomobil clones down under. Not content with the rather pedestrian Goggomobil Sedan & Van, Buckle also had a sports car body designed for the tiny Goggomobile chassis by a race car engineer. 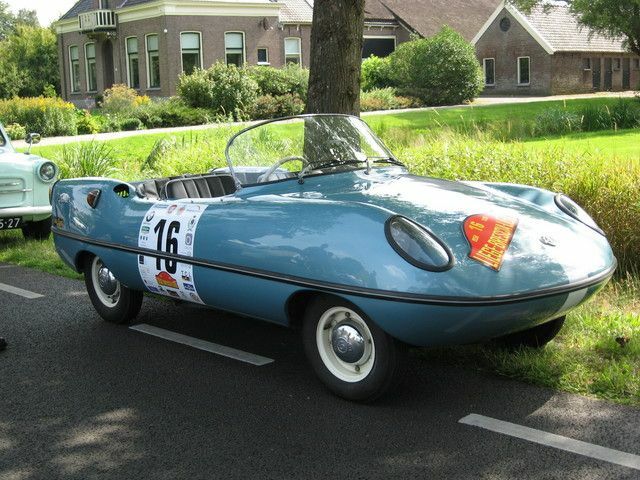 The result is the Goggomobil Dart, the knee high 750lb door-less Micro Sportscar pictured above.